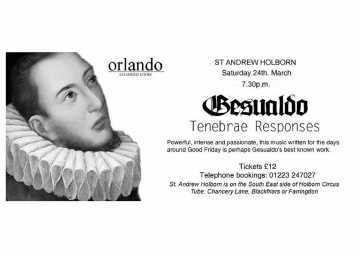 Gesualdo's most celebrated work: a setting of the Tenebrae Responsories published in 1611. The Tenebrae Responsories is an office of matins and lauds sung on the last three days of Holy Week involving the ceremonial lighting and extinguishing candles. Gesualdo's remarkable setting responds to the text very much in the style of madrigals, using sharp dissonance and shocking chromatic juxtapositions to evoke the emotional content of the text dealing with the suffering of Christ. The programme is interspersed with plainchant antiphons, verses and lessons performed by Andrew Griffiths, tenor.